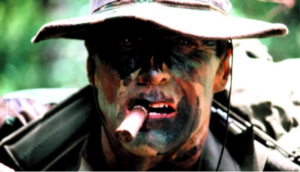 Not to imply that what we do is, on any level, in any way, shape or form, as important as what the brave men and women of the Corps do, but sometimes our approach to designing a log home or timber style home channels Clint Eastwood in the movie “Heartbreak Ridge”. Even with today’s digital workhorse design tools, programs that literally make two-dimensional log home floorplans come to life, allowing clients to “walk” through their future White Cedar homes, some clients need that extra, over-and-above, improvise/adapt/improvise tactic to feel that space, see and touch that certain element or understand the what/how/why of a design. The scenery gets more beautiful and more rustic when you travel north up Michigan’s Upper Peninsula. As you wander through the region’s hardwood forests, you’ll walk under arbors of beech trees and sugar maples and white pines. You’ll encounter many animals, too, from graceful deer and loons to imposing moose and bear. But if you’re in the area around Gibson Lake, Neil and Nancy Krushcke’s home might be more difficult to spot — especially during a UP winter. The remote property, reachable only by a logging track, sits 10 miles from a paved road and 40 minutes from the nearest town. It’s the very definition of remote. Built to be one with its wild surroundings, the home’s White Cedar exterior would blend in perfectly with a winter landscape if not for the soft interior lights and flickering fireplace flames that set the house aglow. It used to be the bookstore, between GARDENING and COOKING. 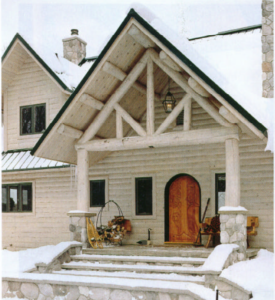 Here was found the analog version of googling “log home floorplans” – LOG HOME LIVING, LOG CABIN HOMES, COUNTRY’S BEST LOG HOMES, TIMBER FRAME HOMES and at least a dozen different titles of log home floorplans compilations. 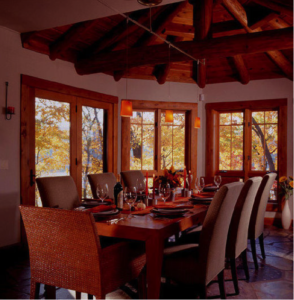 This was a monthly ritual for would-be clients, foraging for log home floorplans, as well as a quick glance over at the ARCHITECTURE isle to see if anyone had released a new guide to building custom log homes or a new photo portfolio on refined rustic decorating, but floorplans were king. Every client had stacks of these magazines, tear outs and back-of-cocktail-napkin sketches in a box. 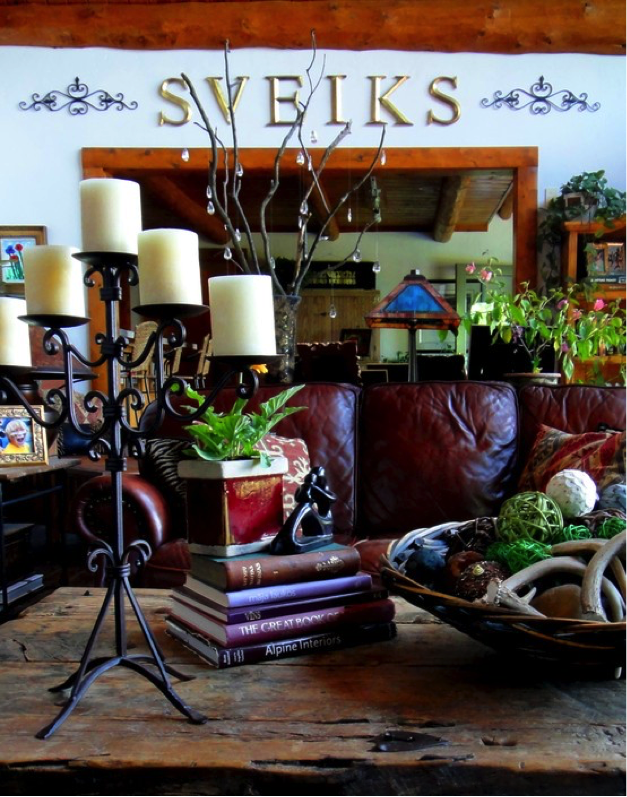 Fast forward a decade or two and a typical starting place for clients is at home, on the couch in pajamas, latte’ in one hand, ipad in the other, searching phrases like “luxury log home floorplans”, “timber frame homes” and “White Cedar log homes” (the astute ones…). The venue has changed, but the game is the same. Log home floorplans are saved, shared and edited and re-edited with digital red lines and virtual sticky notes. No more three ring binders; it’s in the cloud now. As an experienced big-game hunter, Tom Winkel probably doesn’t get lost in the woods too often. 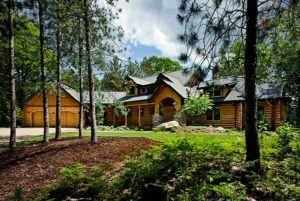 So, one might argue that when he and his wife, Carol, made a navigational error and stumbled upon a Town + Country Cedar Homes model in northern Michigan, something was drawing them to it. Once they stopped and toured the house, they knew. This would be their new home.